This article is about the men's golf tournament. For other uses, see U.S. Open. The first U.S. Open was played on October 4, 1895, on a nine-hole course at the Newport Country Club in Newport, Rhode Island. It was a 36-hole competition and was played in a single day. Ten professionals and one amateur entered. The winner was Horace Rawlins, a 21-year-old Englishman, who had arrived in the U.S. earlier that year to take up a position at the host club. He received $150 cash out of a prize fund of $335, plus a $50 gold medal; his club received the Open Championship Cup trophy, which was presented by the USGA. In the beginning, the tournament was dominated by experienced British players until 1911, when John J. McDermott became the first native-born American winner. American golfers soon began to win regularly and the tournament evolved to become one of the four majors. Since 1911, the title has been won mostly by players from the United States. Since 1950, players from only six countries other than the United States have won the championship, most notably South Africa, which has won five times since 1965. A streak of four consecutive non-American winners occurred from 2004 to 2007 for the first time since 1910. These four players, South African Retief Goosen (2004), New Zealander Michael Campbell (2005), Australian Geoff Ogilvy (2006) and Argentine Ángel Cabrera (2007), are all from countries in the Southern Hemisphere. Northern Ireland's Graeme McDowell (2010) became the first European player to win the event since Tony Jacklin of England in 1970; three more Europeans won in the next four editions, making it only three American wins in the 11 tournaments from 2004-2014. U.S. Open play is characterized by tight scoring at or around par by the leaders, with the winner usually emerging at around even par. A U.S. Open course is seldom beaten severely, and there have been many over-par wins (in part because par is usually set at 70, except for the very longest courses). Normally, an Open course is quite long and will have a high cut of primary rough (termed "Open rough" by the American press and fans); undulating greens (such as at Pinehurst No. 2 in 2005, which was described by Johnny Miller of NBC as "like trying to hit a ball on top of a VW Beetle"); pinched fairways (especially on what are expected to be less difficult holes); and two or three holes that are short par fives under regular play would be used as long par fours during the tournament (often to meet that frequently used par of 70, forcing players to have accurate long drives). Some courses that are attempting to get into the rotation for the U.S. Open will undergo renovations to develop these features. Rees Jones is the most notable of the "Open Doctors" who take on these projects; his father Robert Trent Jones had filled that role earlier. As with any professional golf tournament, the available space surrounding the course (for spectators, among other considerations) and local infrastructure also factor into deciding which courses will host the event. The U.S. Open is open to any professional, or to any amateur with a USGA Handicap Index not exceeding 1.4. Players (male or female) may obtain a place by being fully exempt or by competing successfully in qualifying. The field is 156 players. All remaining spots after the second top 60 OWGR cutoff date filled by alternates from qualifying tournaments. The exemptions for amateurs apply only if the players remain amateurs as of the tournament date. Before 2011, the sole OWGR cutoff for entry was the top 50 as of two weeks before the tournament. An exemption category for the top 50 as of the tournament date was added for 2011, apparently in response to the phenomenon of golfers entering the top 50 between the original cutoff date and the tournament (such as Justin Rose and Rickie Fowler in 2010). Through 2011, exemptions existed for leading money winners on the PGA, European, Japanese, and Australasian tours, as well as winners of multiple PGA Tour events in the year before the U.S. Open. These categories were eliminated in favor of inviting the top 60 on the OWGR at both relevant dates. Starting with the 2012 championship, an exemption was added for the winner of the current year's BMW PGA Championship, the European Tour's equivalent of The Players Championship. Potential competitors who are not fully exempt must enter the Qualifying process, which has two stages. Firstly there is Local Qualifying, which is played over 18 holes at more than 100 courses around the United States. Many leading players are exempt from this first stage, and they join the successful local qualifiers at the Sectional Qualifying stage, which is played over 36 holes in one day at several sites in the U.S., as well as one each in Europe and Japan. There is no lower age limit and the youngest-ever qualifier was 14-year-old Andy Zhang of China, who qualified in 2012 after Paul Casey withdrew days before the tournament. The USGA has granted a special exemption to 34 players 52 times since 1966. Players with multiple special exemptions include: Arnold Palmer (1978, 1980, 1981, 1983, 1994), Seve Ballesteros (1978, 1994), Gary Player (1981, 1983), Lee Trevino (1983, 1984), Hale Irwin (1990, 2002, 2003), Jack Nicklaus (1991, 1993, 1995, 1996, 1997, 1998, 1999, 2000), Tom Watson (1993, 1996, 2000, 2003, 2010). Irwin won the 1990 U.S. Open after accepting a special exemption. In the 2016, a special exemption was extended to former champion Retief Goosen (2001, 2004). In 2018, a special exemption was extended to former U.S. Open champions Jim Furyk (2003) and Ernie Els (1994, 1997). The purse at the 2017 U.S. Open was $12 million, and the winner's share was $2.16 million. The European Tour uses conversion rates at the time of the tournament to calculate the official prize money used in their Race to Dubai (€10,745,927 in 2017). In line with the other majors, winning the U.S. Open gives a golfer several privileges that make his career much more secure if he is not already one of the elite players of the sport. U.S. Open champions are automatically invited to play in the other three majors (the Masters, The Open Championship (British Open), and the PGA Championship) for the next five years, as well as The Players Championship, and they are exempt from qualifying for the U.S. Open itself for 10 years. Winners may also receive a five-year exemption on the PGA Tour, which is automatic for regular members. Non-PGA Tour members who win the U.S. Open have the choice of joining the PGA Tour either within 60 days of winning, or prior to the beginning of any one of the next five tour seasons. Finally, U.S. Open winners receive automatic invitations to three of the five senior majors once they turn 50; they receive a five-year invitation to the U.S. Senior Open and a lifetime invitation to the Senior PGA Championship and Senior British Open. The top 10 finishers at the U.S. Open are fully exempt from qualifying for the following year's Open, and the top four are automatically invited to the following season's Masters. Up to 2017, the U.S. Open retained a full 18-hole playoff the following day (Monday). If a tie existed after that fifth round, then the playoff continued as sudden-death on the 91st hole. The U.S. Open advanced to sudden-death three times (1990, 1994, 2008), most recently when Tiger Woods defeated Rocco Mediate on the first additional playoff hole in 2008. Before sudden-death was introduced in the 1950s, additional 18-hole rounds were played (1925, 1939, and 1946) to break the tie. When the playoff was scheduled for 36 holes and ended in a tie, as in 1931, a second 36-hole playoff was required. Since 2018, the USGA adopted a two-hole aggregate playoff format, after consulting fans, players and media partners. Sudden death will still be played if the playoff ends tied. Willie Anderson, Bobby Jones, Ben Hogan and Jack Nicklaus hold the record for the most U.S. Open victories, with four victories each. Hale Irwin is the oldest winner of the U.S. Open at 45 years and 15 days in 1990. The youngest winner of the U.S. Open is John McDermott at 19 years, 10 months, 14 days in 1911. The eighteenth state to host the tournament was Washington in 2015, followed by Wisconsin in 2017. Most victories: 4 by Willie Anderson 1901, 1903–1905; Bobby Jones 1923, 1926, 1929–30; Ben Hogan 1948, 1950–51, 1953; Jack Nicklaus 1962, 1967, 1972, 1980. NOTE: Hogan also won the 1942 Hale America National Open which was held jointly by the USGA, PGA and Chicago GA for the benefit of the Navy Relief Society and the USO. Most consecutive victories: 3 by Willie Anderson 1903–1905. Most strokes under par for 72 holes: 16-under (268) by Rory McIlroy, 2011; 16-under (272) by Brooks Koepka, 2017. Lowest score for 18 holes: 63 – Johnny Miller, 4th round, 1973; Jack Nicklaus, 1st, 1980; Tom Weiskopf, 1st, 1980; Vijay Singh, 2nd, 2003; Justin Thomas, 3rd, 2017; Tommy Fleetwood, 4th, 2018. Lowest score for 18 holes in relation to par: −9 Justin Thomas, 3rd round, 2017. All four rounds under 70: Trevino, 1968; Janzen, 1993; McIlroy, 2011. There is an extensive records section on the official U.S. Open website. As of 2015, Fox Sports is the official broadcaster of the U.S. Open, as the result of a 12-year deal with the USGA for exclusive rights to its tournaments through 2026. Coverage will be telecast by Fox (over-the-air) and Fox Sports 1 (cable). The 2018 edition of the U.S. Open featured a total of 37 hours of coverage in the United States, with 19.5 hours being on Thursday and Friday, and 17.5 hours being on Saturday and Sunday; the Fox Sports 1 cable network carried a total of 13.5 hours of coverage on Thursday and Friday. The Fox broadcast network had a total of 23.5 hours of coverage Thursday through Sunday, with 6 hours Thursday and Friday, and 17.5 hours Saturday and Sunday. The overall 37–hour total was down 1.5 hours from last year's total of 38.5 hours, due to the Fox broadcast network's coverage having 23.5 hours this year, compared to the 24.5 hours it had last year, and the Fox Sports 1 cable network's 13.5 hours this year, compared to the 14 hours it had last year. Coverage was previously televised by NBC and ESPN through 2014. NBC's most recent period as rightsholder began in 1995; ABC held the broadcast rights from 1966 through 1994. In Australia, from 2015 Fox Sports Australia is the exclusive broadcaster of the U.S. open until 2018. ^ a b Most of the course lies within the hamlet of Old Bethpage, but the clubhouse is in Farmingdale, and the park has a Farmingdale postal address. Both places are within the Town of Oyster Bay. ^ La Jolla is a neighborhood within the city of San Diego that has a unique postal identity. ^ a b c d The course straddles the border between Daly City and San Francisco; the club's postal address is in San Francisco. ^ The club is located in a portion of the Duluth postal area that became part of the newly incorporated city of Johns Creek in 2006. Although the club is still served by the Duluth post office, it now lists its mailing address as Johns Creek. ^ The club has a St. Louis postal address, but is located in the Missouri suburb of Town and Country. ^ Pacific Palisades is a neighborhood within the city of Los Angeles that has a unique postal identity. ^ Brent Kelley. "First Winner of US Open Golf Tournament". About.com Sports. 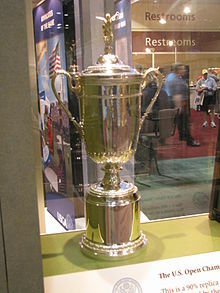 ^ "US Open Golf History". ^ a b "112th U.S. Open Championship application form" (PDF). USGA. Archived from the original (PDF) on May 25, 2013. Retrieved June 11, 2012. ^ "U.S. Open – Exemption List". USGA. Archived from the original on July 14, 2016. Retrieved February 24, 2015. ^ a b "U.S. Junior, Mid-Amateur Champs to Receive U.S. Open, Women's Open Exemptions" (Press release). USGA. October 5, 2017. Retrieved October 13, 2017. ^ a b "USGA - Changes Made To Exemptions For 2012 USGA Championships". USGA. February 23, 2012. Retrieved June 12, 2013. ^ a b "U.S. Open to expand world-ranking use". ESPN. Associated Press. February 5, 2011. Retrieved February 5, 2011. ^ "USGA Announces Changes To Exemption Categories" (Press release). USGA. February 5, 2011. Retrieved January 12, 2012. ^ "2012 U.S. Open Championship Media Guide" (PDF). United States Golf Association. p. 31. Archived from the original (PDF) on May 22, 2013. Retrieved June 19, 2015. ^ "U.S. Open: Special Exemptions". USGA. December 12, 2016. ^ Herrington, Ryan (March 14, 2018). "USGA gives Ernie Els, Jim Furyk special exemptions into 2018 U.S. Open at Shinnecock Hills". Golf Digest. ^ "U.S. Open abandons 18 holes for 2-hole playoff". ESPN. Associated Press. February 26, 2018. ^ "Champions". U.S. Open. Archived from the original on March 3, 2008. Retrieved April 26, 2008. ^ a b "Age". U.S. Open. Archived from the original on March 3, 2008. Retrieved April 26, 2008. ^ a b "Rory McIlroy runs away with Open title". ESPN. June 20, 2011. Retrieved June 20, 2011. ^ Murray, Scott (June 19, 2011). "US Open 2011 – day four as it happened". The Guardian. Retrieved June 12, 2013. ^ "U.S. Open History – Records". USGA. Retrieved June 17, 2018. ^ Haggar, Jeff (June 10, 2013). "History of US Open golf TV coverage (1954-present)". Classic TV Sports. ^ Baysinger, Tim (August 7, 2013). "Fox Sports Reaches Rights Deal for Golf's U.S. Open". Broadcasting & Cable. Retrieved August 7, 2013. ^ Rosaforte, Tim (June 27, 1994). "See Ya Later". Sports Illustrated. p. 49. Retrieved June 12, 2013. ^ Knox, David (April 9, 2015). "Fox Sports tees off with more Golf". TV Tonight. Retrieved April 9, 2015. Wikimedia Commons has media related to U.S. Open (golf).